A typhoon is a tropical cyclone that generally tracks in a westward or northern direction. Basically it is a hurricane formed in the western North Pacific Ocean. 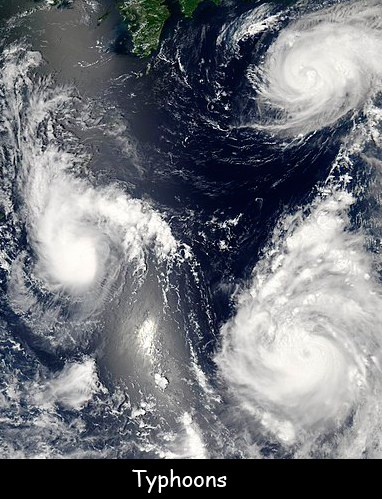 Cyclone, Hurricane, Typhoon all are same but have different names depending on the ocean basin they have formed in. All of them are strong tropical storms with winds over 75 miles per hour. The spin in the hurricane requires Coriolis force to be formed. This force is too weak near the equator so these tropical storms do not form there. They are most commonly formed in late summers and if the winds hit 150 miles per hour then it becomes a Super typhoon. The eye of a storm can be defined as its low-pressure center which can range from 10 to 40 miles in width. Just outside the eye of the storm winds can reach at speeds of 110 miles per hour. Supertyphoons are very destructive and can measure several hundred miles across. The Caroline Islands in the south-western Pacific Ocean rarely get hit by fully developed storms because this is where these storms originate. A thunderstorm can take hours or even days to develop into a strong tropical cyclone. The usual typhoon season starts in the early summer and ends in early autumn. It generally coincides with the monsoon season in Southeast Asia. They typically form between 5 to 15 degrees latitude north and south of the equator. Declan, Tobin. " All Facts for Kids about Typhoons ." Easy Science for Kids, Apr 2019. Web. 23 Apr 2019. < https://easyscienceforkids.com/all-about-typhoon/ >.